There’s a very good chance you’re aware of the smoked by Windows Phone campaign. It’s a brilliant marketing stunt where Ben the ‘PC guy’ challenges you to everyday tasks like checking for a restaurant on your smartphone or taking a picture. Whoever finishes the task first is declared a winner. If you win you get 100$ and if you lose you have to stand in front of the camera and admit you got smoked by a Windows Phone. This particular campaign has generated a lot of interest with many people praising the concept. However a guy named ‘Sahas Katta’ has a slightly less ‘fun’ experience. Microsoft has bumped up the prize money from 100$ to a PC worth 1000$. 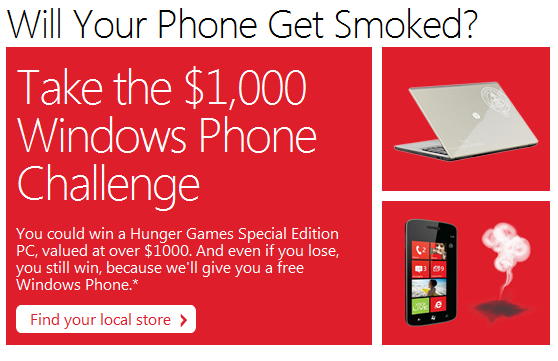 All you have to do is smoke a Windows Phone and the PC is yours. Sahas, in the Santa Clara Microsoft store was given a challenge to check the weather of two different cities. Luckily for him he had already set up a widget that showed weather information for two cities. To top if off he had disabled his lock screen, which is a default feature in most Android phones (he was using a Galaxy Nexus). So naturally you’d think he’d win right? Well he did. Except that the Microsoft folks in the store refuse to acknowledge his victory. Firstly, the challenge asked for checking weather of two cities. The Microsoft store employee had already set up his phone to show two live tiles showing weather of two cities. Windows Phone does not come with live tiles set up like this by default. So the challenge was already skewed heavily in favor of Windows Phone. All the Microsoft employee did was set up his phone the way he wanted before he gave out the challenge. Now despite all this Sahas won. This is because all he had to do was press the home button which took him right to his home screen where he had the widgets set up. With Windows Phone you have to move past the lock screen. Even with a clear victory he was declared the loser. The reason given? The Windows Phone won ‘just because’. Read the whole story here to decide for yourself whether Microsoft is making a meal out of what was initially a brilliant marketing campaign.